If you're going to buy a salvage motorcycle, the easiest way is to buy one at an auction. You can also buy them personally or from friends who've written off their motorcycles. But supply will be limited, in that way, and you may not get it for as low a price. There are a number of auctions around the Bay Area. The main one is Manheim. Unfortunately, individual buyers can't register there without a company. To buy from there, you have to go through a broker. There are two ways of buying through public auctions - either directly from one of the two major auction houses (IAAI and Copart), or through a broker like Dashub (which I never learned to pronounce). You can bid directly through IAAI or Copart, but NOT in California without an appropriate business license. In certain states, you need to have a broker's license. 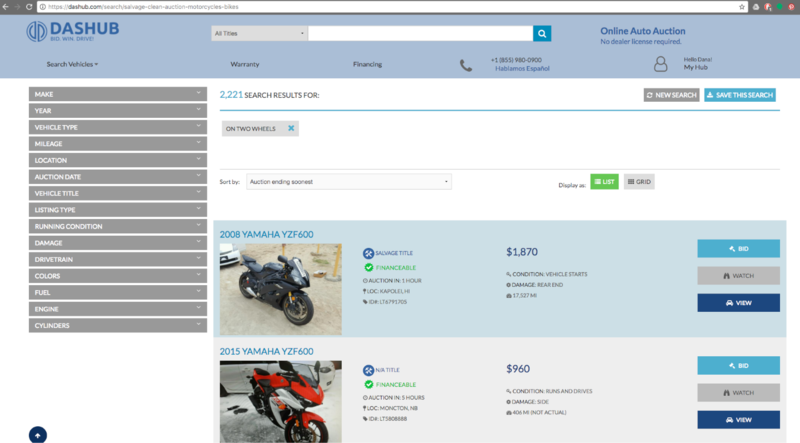 So if you want to bid on a motorcycle in a location where you don't need a brokers license… go through Copart. To keep shipping costs low, I prioritized motorcycle auction inventory in a few nearby states to CA: WA, OR and NV. Unfortunately, it’s all very low inventory. Purchasing a motorcycle from out-of-state also presents some paperwork questions I didn't want to go through. The other major option is to go through a broker, who then bids at Copart for you. A good online interface. This used to be a significant advantage, but Copart's interface is now (as of 2017) excellent. Integrated shipping services. I don’t think Copart even wants to deliver to San Francisco. Shipping from around the country using Dashub costs about $400. You are relieved of the stress of bidding. Dashub. This is a general bidding company that interfaces with Copart. Salvage Bid. Looks decent, but I can’t say it looks as nice. Ride Safely - some people on Reddit mentioned this. Based on the above, I decided to use Dashub merely because I had heard of it before. However, on Reddit, people provide reviews of all those services, and they seem similar. Part 1 of a series in buying, restoring and selling for a profit a salvage-title motorcycle.